If you want to make music on a computer or iOS device, you'll probably decide that a MIDI keyboard is one of the first things you need. These piano-style devices can be plugged into your PC or Mac via USB - or, in some cases, operate wirelessly over Bluetooth - and enable you to play and record with your DAW's software instruments and any VST synth plugins you might have installed. You can buy everything from compact, portable MIDI keyboards to full-size 88-note models with weighted hammer-action keys, and some come with additional features such as knobs, pads, buttons and faders that give you even more control over your software. Prices vary, too; you can get a perfectly decent budget MIDI controller keyboard for less than $100/£100, but if you spend more you'll get a better-quality model with higher specs. Many of the best MIDI controller keyboards come with templates for the most popular DAWs - Ableton Live, Logic Pro, FL Studio, etc - making it easy to get them up and running. Whether you want a portable keyboard to go with your laptop or a full-size MIDI controller for your studio, there are plenty of options, so to help you choose the right one, we've come up with a list of the best USB MIDI controllers you can buy right now. The Keystation Mini 32 gives you two and a half octaves of low-profile mini keys to work with. This means that you can just about get away with two-handed playing, though you couldn't exactly deliver a piano recital on it. The keys play pretty well, though, and assignable controllers include a pleasantly chunky knob and three buttons (these default to controlling pitchbend up/down and modulation). There are backlit octave up/down (with limited re-assignability) and sustain buttons, too, plus a further one for entering edit mode. The Keystation Mini 32 certainly looks the part, and it performs well. In fact, if you want an affordable and truly portable option, it's one of the best MIDI keyboards you can buy. Looking sleek and slim, the Xkey's 2-octave keyboard is of the low-profile variety (a mere 16mm deep), yet still retains a decent amount of key travel, making it surprisingly playable. Perhaps the most notable feature, though, is polyphonic aftertouch, which means you can add an extra level of expression on a per-note basis (providing the instrument you're playing supports it). On the downside, it's hard to use the Pitchbend/Modulation buttons with any degree of accuracy, but if you want a stylish, portable keyboard with full-size keys, this is a very attractive option. Note that, if you want to stretch your budget there's a 37-note model, and CME also has an Air version which offers wireless operation via Bluetooth. The microKey 2 Air range includes 25-, 37-, 49- and 61-note models, all of which have the advantage of working wirelessly over Bluetooth. If you want to use this feature you'll have to install a couple of AA batteries, but these last for a good length of time and good old USB bus-powering is also an option. The microKey 2 Air 25 isn't the most controller-packed keyboard, but it gives you the basics and plays far better than many of its rivals. It's also easy to set up and operate, so if you want to free yourself from the tyranny of cables, you've found the MIDI controller keyboard you need. It won't be for everyone, but Keith McMillen's unique mini keyboard certainly has some tricks up its sleeve. The main focus is on the 25 'Smart Sensor' keys, which are velocity-, tilt- and pressure-sensitive, and light up when touched. These do take a little bit of getting used to, but once you've got the hang of them, they start to feel very expressive, and also surprisingly responsive. There are micro USB and CV outputs, plus the option to add a standard MIDI port. The QuNexus appears to be extremely durable, too. This is a personable little controller with a unique feature set that would make it a useful addition to any laptop bag. Compact, light and very portable. This simple-looking, 32-note mini keyboard might look a little underwhelming at first glance. However, the KeyStep packs in a surprising amount of functionality and an impressive number of well-designed features. There's a USB connection, for hooking the controller up to a computer, MIDI In and Out ports and CV Pitch, Gate and Mod outputs. There are also mini-jack Sync In/Out ports, which will work with pulse clock devices, such as Korg's Volca range, or can send and receive DIN Sync messages via a (separately purchased) adaptor. Alongside its standard MIDI keyboard functions, the KeyStep also features a built-in polyphonic sequencer, arpeggiator and chord mode. The sequencer has an eight-pattern memory, which comes pre-loaded with patterns but can be overwritten by user input. With this much functionality packed into a portable and convenient controller keyboard, at this price the KeyStep is easy to recommend. Today’s buyers of keyboard controllers are spoilt for choice, but if you’re looking for a full piano-size 88-note MIDI controller, said choices are more limited. One great option is Nektar’s Impact LX88+, which combines an 88-key semi-weighted USB-powered keyboard with extensive DAW control via nine sliders, nine buttons, eight knobs, eight pads and transport controls. Despite the number of features, the LX88+ is reasonably compact and light enough to be portable. What’s more, the keys feel good and the mechanical noise is quite low. The LX88+ won’t suit everyone, and some 88-key users will be after a full weighted hammer-action, but at this price it’s a bargain and well worth testing. It might share a note layout with other controller keyboards, but ROLI’s Seaboard Block is a different animal altogether. Like the more expensive Seaboards, it's a pressure-sensitive, continuous surface that responds to even subtle gestures. Using its 24 'keywaves', you can shape notes as you play, adjusting the character of the sound with your finger movements. As a wireless, portable, multitouch controller for gigging, travelling, or in the studio, Seaboard Block is a godsend, and retains the upmarket feel of its bigger siblings in a more affordable form-factor. Couple this with its expandability, via other products in the Blocks range, and you've got a performance tool that turns heads and offers high quality throughout. Inspiring, innovative and addictive! The iRig Keys I/O combines a MIDI controller keyboard and audio interface into a single unit, and is designed to be as compact as possible without compromising on playability. It also comes with a seriously impressive line-up of bundled software. The unweighted keys are light and responsive, with satisfying travel and minimal lateral movement. The onboard audio interface operates at up to 24-bit/96kHz, and sounds good doing it. The iRig Keys I/O 49 is small enough to find a space on even the most hectic of studio desks, equipped to handle basic recording duties and general purpose MIDI control on stage and in the studio, and pretty good value. What's more, it comes with a knockout software bundle. The Komplete Kontrol S61 MkII is a smart MIDI keyboard controller that offers pre-mapped control of NI's Komplete instruments and any third-party plugins that support the NKS standard. In comparison to its predecessor, the the Komplete Kontrol MkII also adds two high-resolution colour screens, along with 17 additional function buttons. There’s tighter DAW and Maschine integration, too, making it possible to mix, navigate and edit projects from the hardware. As before, there’s a Fatar keybed and Light Guide, and we welcome the arrival of proper pitch and mod wheels rather than touchstrips. That said, a single horizontal touchstrip is supplied and can be used for additional expression. If you liked the idea of Komplete Kontrol the first time around, the good news is that there’s even more to like about it now. You can do so much more from the device itself, with better visual feedback and much deeper levels of integration front and centre of its workflow. If you’re already wedded to the Komplete software package, nothing will help you work with it as musically as Komplete Kontrol MkII. Available in 25-, 49- and 61-key versions (we received the A25 for review), the A-Series borrows many of the S-Series’ best features (see above), including the 4D Encoder (a joystick/rotary control/button combo) for software navigation; eight touch-sensitive knobs for plugin parameter control; beefy pitch and mod wheels; and most of the same backlit buttons, albeit laid out slightly differently. There are, however, two major cuts: the dual colour LED screens (or alphanumeric LEDs on the S25, which still languishes at Mk1), and the unique per-key Light Guide LEDs. Even with those things taken away, though, and the reduced level of Maschine integration, we’re still very much blown away by the value proposition presented by the A25 and the A-Series keyboards in general. Incredibly well-built and wonderfully playable, they deliver up the Komplete Kontrol experience at a truly irresistible price. Sure, you can plug the SL MkIII into a computer and use it to control your DAW, but with an eight-channel onboard sequencer and multiple forms of digital and analogue output, this latest SL really can do much more besides. Novation has done an excellent job in making setup as hassle free as possible, but given how adaptable the SL MkIII is, you’ll still need to spend some time configuring it to best adapt it to your own setup. It doesn’t quite match the plug-and-play immediacy of NI's Komplete Kontrol system, but offers much more flexibility for interfacing hardware and software. The ability to sequence and control analogue hardware, MIDI-equipped instruments, plugins and your DAW all from one interface and clock source is excellent, and if you dig into the SL MkIII’s versatile workflow, and you’ll find that there’s a deep well of creative possibilities just waiting to be explored. KeyLab is Arturia’s flagship controller keyboard, and the MkII comes in 49- and 61-key versions in black and white. 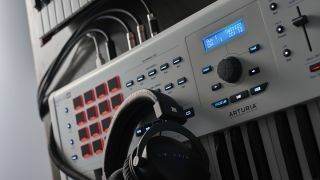 The MkII’s keyboard and pads are bolstered by DAW controls and deep integration with Arturia’s bundled Analog Lab 3 software. Although similar in layout to the KeyLab Essential, the MkII is a very different unit, with a higher pricetag and more upmarket feel. The aluminium case feels robust and the Pro-Feel keybed is fantastic, delivering excellent sensitivity across the full range of velocities. The metal pitch and mod wheels are light and responsive. KeyLab MkII is operationally intuitive, with three distinct modes: DAW, Analog Lab and User (there are ten user configurable presets) - selected via dedicated mode buttons in the centre. The KeyLab MkII not only delivers fine playability, but also tackles DAW control and synth editing with aplomb. Throw in CV connection capabilities and standalone operation and the price seems justified.